Wn349 Auderville la Roche, Luftwaffe station "Ammer", K.V.U.Gruppe Joburg, K.V.Gruppe Periers. Wn349 Auderville la Roche, Luftwaffe station "Ammer"
1 x SK/Nachrichten (FA Auswertung [evaluation]). 2 x Wurzburg Riese Fu.SE 65. 1 x NrM16 et N58. 1 x Freya Fu.MG 401 Nr 1840. 1 x Freya Fu.MG 450 Nr 143. 1 x FA Generator building. Some other odd buildings still remaining. Freya Fu.MG 401 Nr 1840. Freya Fu.MG 450 Nr 143. This is the start of "Ammer" the first L410A Flak bunker. Wn349 Auderville la Roche, Luftwaffe station "Ammer". 1940 and the Luftwaffe may have found this area a good spot for its radars.. 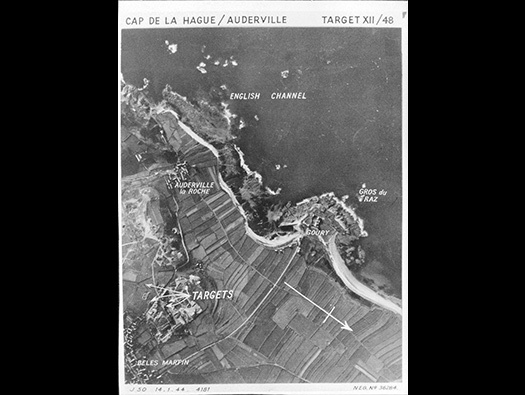 This is an interesting picture, taken in 12-08-1940 Target VI/4 Cap De La Hague/Auderville (neg No.5997). 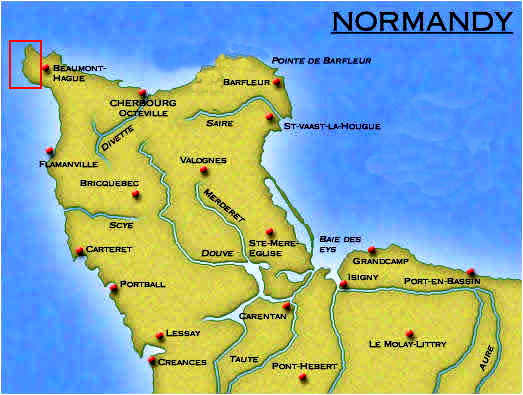 This was August 1940 two months after the British were removed from France and the French Government surrendered to the very victorious German Army. The Germans set something here possibly a new type of radar unknown the the RAF and needed watching. This is the target today next to the Generator house. 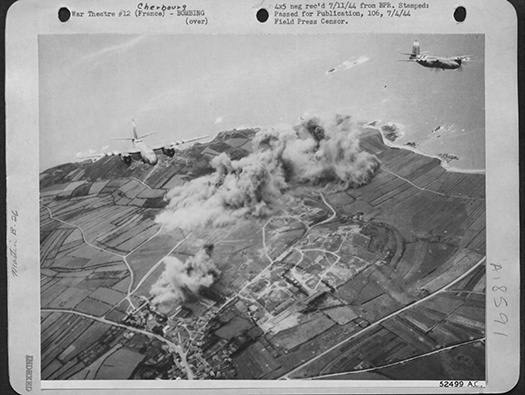 American Marauder medium bombers carpet bombing the battery of Wn349 Auderville la Roche, Luftwaffe station "Ammer".. Completely missing the radar site. The picture shows a Marauder with D-Day stripes on its wings, so this picture must be post D-day as the stripes were painted on no earlier than the 4/5 June. A control tower at an American airfield in England. A closer look at Wn349. Most of the buildings still remain to be found. The very large FA Auswertung (Evaluation) building surprisingly still complete. This is the plan today and all can be found (the FA MG Stand I have not looked for yet). 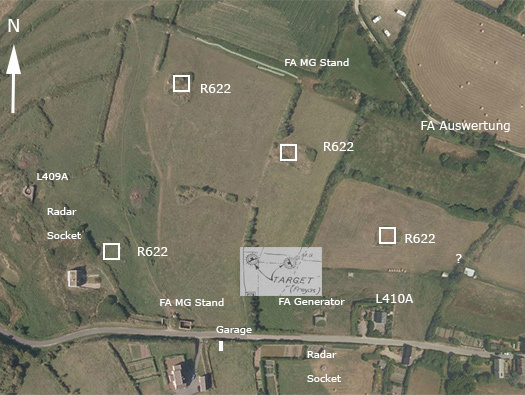 On the target maps it shows where the Freyas were. V229 socket for the Wurzburg. Showing the sites of the two Giant Wurzburg and also the Freyas. RAF Medmenham WAAF interpreters at work. 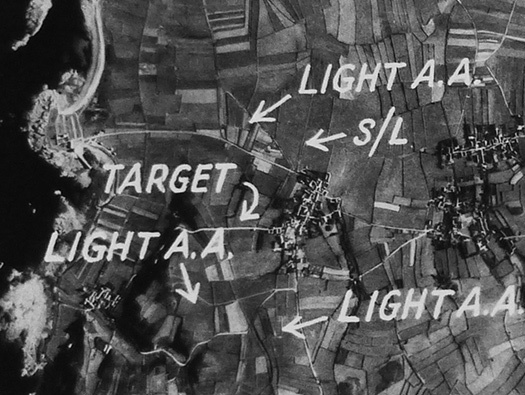 Target File XII/48 air photo. This is showing where the main radar targets are. Target File XII/48 Rhubarb Operation, Cap de la Hague/Auderville. 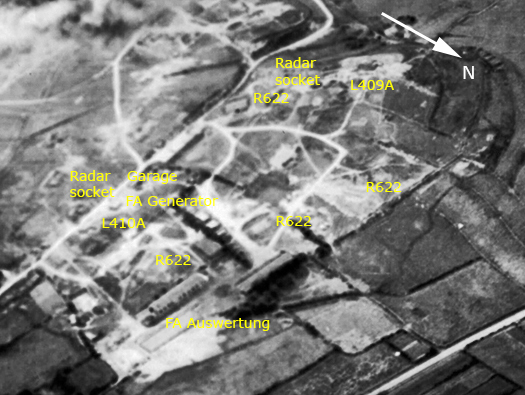 (Airport Reporting Station)..
L410A Emplacement for a 3.7cm Flak. 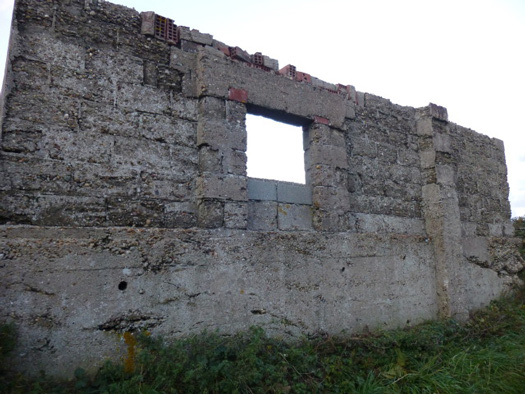 Underneath is a large bunker with two crew rooms, NCO's room, ventilation, ammunition, two entrances with gas locks and a close combat defence room. On the top a 3.7cm Flak gun. 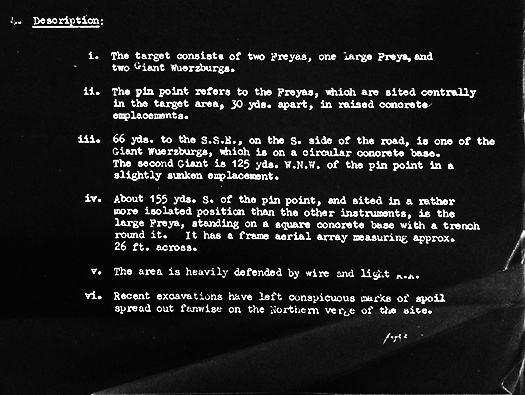 Around the emplacement are four ready ammunition niches. This is where the gun sat and these are the tie downs to bolt the guns chassis to the concrete. Wurzburg Riese Fu.SE 65 V229 socket..
Wurzburg Riese Fu.SE 65 kabin on the rear. What this garage was used for I have no idea. It could have been for the commanding officers Kubelwagen?? A locally built stone and brick with the usual low pitched roof. Rear with an entrance and windows. Screw picket for barbed wire defence. Something lower down the hill. I am unsure what this shed is. It dose have an inscription on its wall. 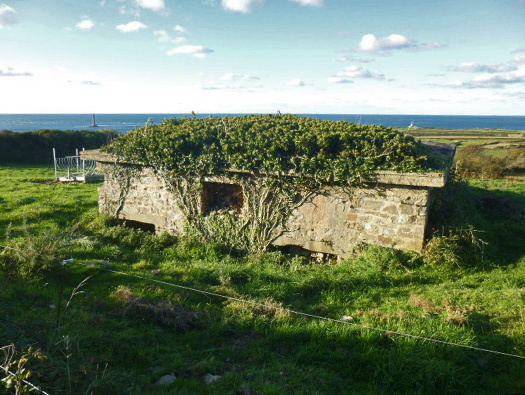 15 to 18 man bunker. Living accommodation for the troops in safety from bombing. 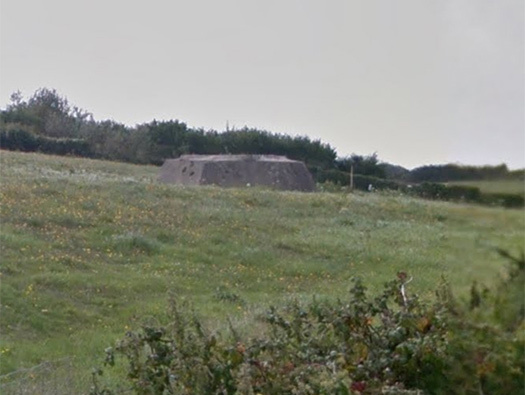 L409A Emplacement for a 3.7cm Flak gun. Inside a crew room, ammunition, store room and gas lock. Vf building of some sort. Two small buildings at the bottom of the hill. The field with the two huts in. The first inside with a sloping roof and made of concrete. The second building. It was quite a squeeze through the door??? why so narrow. The second inside showing its poor quality of build. The second inside with very small windows. One of the R622's up the hill. A very large building a reinforced structure but by no means bomb proof. SK/Nachrichten (FA Auswertung [evaluation]) — Barracks. Auswertung (g) translates to ''Evaluation''. Nachrichten (g) translates to ''News''. Now this is MY opinion and mine only. This is a barracks building, maybe not for sleeping in but offices, canteen and kitchen. I have seen this type of building at StP235 Carneville Osteck Luftwaffe Station "Taussendfussler" has one like this. Plan of an H43 building from www.gyges.dk. The plan is almost the same as the FA here. 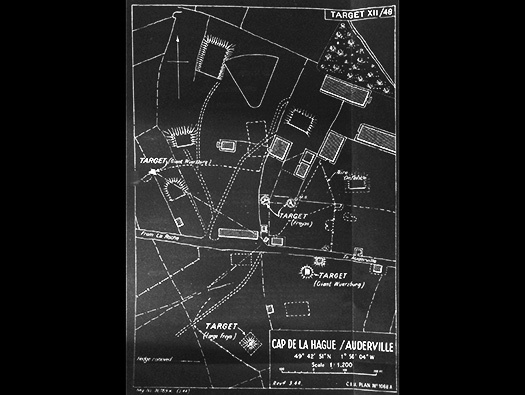 StP235 Carneville Osteck Luftwaffe Station "Taussendfussler"
Plan of the barracks at StP235 Carneville Osteck. End wall and main entrance. This is my plan of the building from memory. The quite grand entrance. Its built in local brick and has a reinforced concrete roof. First room on the right. Working our way along the corridor the building opens up and a large chimney. This I think would have a cooking range and the slotted window on the right a serving hatch. The other side where the cookers chimneys went into the main chimney. Showing the concrete roof and a row of wooden inserts to carry an electric cable. We found parts for Renault 4's and Citroen 2CV's and many more bits. Canteen area. A very large eating area. Washing up sink made of concrete. Windows down the the side. Not sure what this chute is for?? The reason I did not find the R622 is because its behind these cows.